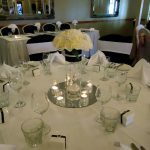 Set of three stunning crystal tulip candelabras complimented with hand-tied posies of mixed fresh flowers displayed in assorted glass vases. Glass mirror base and tealight candles complete this romantic centrepiece. Price – Email us for pricing. 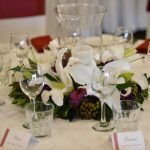 Tall glass cylinder vase with fresh posy of sim carnations. Large mirror base with five tealights in glass holders. Approximate dimensions of cylinder vase 40cm tall x 11cm wide; mirror base is 40cm in diameter. Tall glass cylinder vase with fresh Singapore orchid submerged in water. Large mirror base with five tealights in glass holders and scattered orchids. Approximate dimensions of cylinder vase 40cm tall x 11cm wide; mirror base is 40cm in diameter. Fresh hand-tied posies of mixed cottage flowers arranged into assorted vintage style vases. Vases are displayed on a large mirror. Large fresh floral wreath with roses, lilies and orchids and featuring display of orchids in tall glass vase. Tealights in glass holders surround wreath. Price upon request – Email us for pricing. Large wreath of fresh oriental lilies with mixed flowers and foliage. A glass hurricane vase and candle sit in the centre of the wreath. 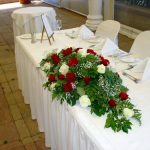 Fresh long and low bridal table arrangement featuring red and white roses. Approx 1.2m long. 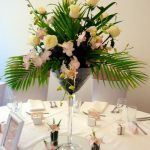 Modern arrangement of fresh roses, orchids and palm greenery displayed in a tall glass martini vase. 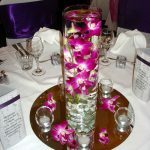 Large mirror and tiny orchid arrangements complete this centrepiece. 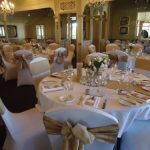 White lycra chair cover with hessian-style sashes and table runners. 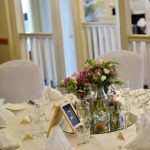 Rustic, vintage styled centrepiece featuring hand-tied posies of mixed fresh flowers, including roses, freesia and lisianthus displayed in assorted glass jars. 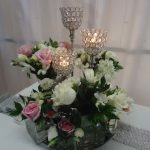 A glass mirror, tealights and crystal scatters complete this centrepiece. 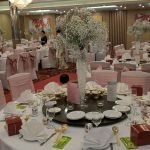 Tall trumpet vase with fresh babys breath centrepieces, dusty pink chair covers. 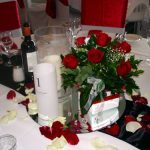 Mixed centrepiece including fresh red rose mini box arrangement and hurricane vase with large pillar candle set on a mirror base with black satin table runner. 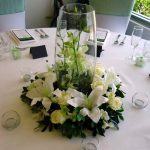 Hand-made stationary, fresh petals and diamond scatters complete this centrepiece. 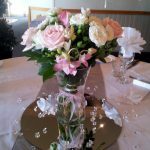 Fresh hand-tied posy of roses, orchids and freesia arranged into glass vase with organza bow detailing. Displayed on a large mirror with diamond scatters.